Remember when I vowed to add more yoga to my life, and remember how I did for quite a bit of time? And then do you remember when I stopped doing yoga? Yeah, I dunno. All three seem like a jumble in my mind because I am not practicing yoga—I really wish I was, though. My runner legs could use some down dog. So when GaiamTV contacted me with a guest post that covered both running and yoga and how the two combine, I took it as a kick in the pants to find a way to get back into some sort of yoga practice. Maybe their words'll do the same for you. When people begin jogging on a regular basis, they usually run into a lot of soreness. Sometimes that soreness is delayed for a day or two, but it eventually hits like a ton of bricks. This pain should not be viewed as a bad thing, as it means the body is getting stronger and will be able to run longer distances in the future. Having said that, yoga is a great way to manage the soreness and help the body recover. For advanced runners that push for longer distances and/or train for races, yoga follows this high-impact cardio quite naturally by stretching muscles. And by preventing pulled muscles. 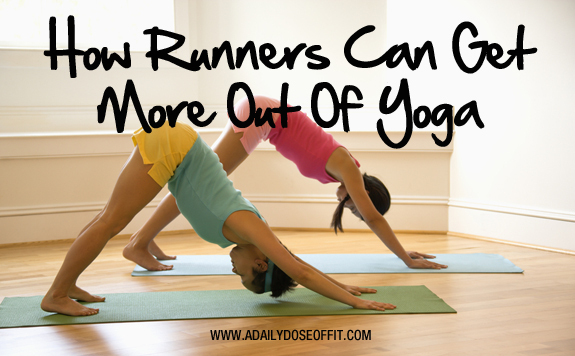 A runner can start their practice by joining a local class or finding yoga videos online. Let's take a look at some basic tips that will help you get the most out of your yoga practice. You don't need much, but you might look into getting a yoga mat. You can do yoga without a mat, but you may find it more comfortable to have a cushioned surface under your knees and wrists. Yoga can be a nice way to ease soreness and care for your body, and a mat can enhance that experience. Other than that, you just need enough room to stretch out your limbs in all directions. And it can be helpful to practice in a place that you find peaceful, such as your backyard or a quiet room. But literally, anywhere safe is fine which is kind of like running—just get out there and go! Do not jerk your body. One of the most important things to remember when you are doing any kind of yoga exercise is that you never want to jerk your body around to get into a pose. One of the main points of yoga is to stretch the body while increasing strength and breath control, and jerking your body around will actually negate this benefit. You should always use slow and controlled movements whenever you are doing yoga so that your muscle control (rather than momentum) gets you into the pose. Be mindful of your body’s limits and do not try to push yourself farther than you can go. Blocks, straps and blankets can help you get into a position without straining any one part of your body. Jogging can improve a yoga workout. One of the main reasons that yoga makes sense for runners is that jogging can be a great way to warm up for a yoga exercise. Some people think that yoga should be used to warm up for jogging, but it actually works both ways. As long as you are stretching out your body with your yoga exercise, you will find that you still receive all of the benefits that come with this form of exercise. You can actually complete your yoga routine at any point during the day, but the fact of the matter is that warm muscles are much easier to stretch during certain yoga exercises. See if yoga works for you. Yoga can be a beneficial and important complement to your running and fitness program. Many runners talk about the "runner’s high" and many people that practice yoga talk about mental clarity and calming that results from their practice—why not combine the two? There are many different types and speeds of yoga, so experiment and find one that works for you. Most yoga is a total-body experience, and you might be surprised how much you sweat. But at a bare minimum, everyone can benefit from the calming and restorative effects of stretching and breathing. GaiamTV did not compensate me for this guest post. Check out the links, don't check out the links...it's entirely up to you. And it makes no difference to me. But seriously, do some yoga! Or at the very least, stretch! !